I’ve been taking self-portraits for a few years now. I’m addicted to my own face. I love taking pictures of my self and posting the pictures on social networking sites. To me, the profile picture is an essential part of the social networking experience, a means of introducing myself to the community. The profile pic says: "This is a bit of who I am right now, for better or worse." "Having never met you before but already hating your guts. It must be your picture." ~A recent anonymous blog comment on this blog. How are my self portraits different than, say, Rembrandt's self-portraits? Of course, there's the medium, and the level of talent, but is my impulse essentially different? 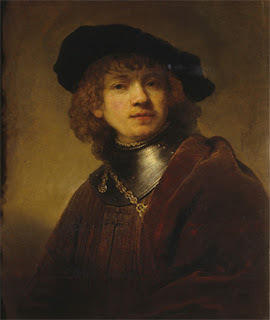 In an 2006 article for Smithsonian magazine, celebrating Rembrandt's 400th birthday, Stephanie Dickey wrote: "Rembrandt painted, etched, and drew some 70 self-portraits, more than any other well-known artist of his time. By making his face the centerpiece of his art, he engaged in a uniquely personal means of self-marketing." Rembrandt was certainly not unique in this way. Self portraiture has been a viable means of "self-marketing" at least since the Renaissance. Giotto included himself in a cycle of "eminent men" in the Castle of Naples. Botticelli made himself the hero of the Adoration of the Magi. Van Gogh painted more than twenty self-portraits. Frida Kahlo is famous for her self-portraits. Was "self-marketing" the impulse behind these various painters use of self-portraiture? Perhaps so (Giotto, for example, or Botticelli) but for many painters, "self marketing" was only part of the impulse. Frida Kahlo, for example, painted herself as a genuine means of self-fulfillment. She started painting after a terrible accident, in 1927, left her bed-ridden and severely wounded. "From that time," she later explained, "my obsession was to begin again, painting things just as I saw them with my own eyes and nothing more…Thus, as the accident changed my path, many things prevented me from fulfilling the desires which everyone considers normal, and to me nothing seemed more normal that to paint what had not been fulfilled." For Kahlo self-portraiture was a means of self-birth. The fact that her self-portraits so easily helped to advance or "market" her art was, for her, incidental. 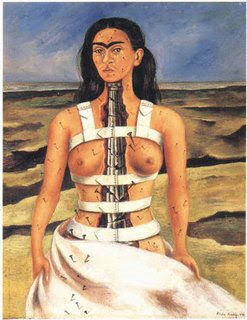 The Broken Column, painted in 1944 after Kahlo had undergone surgery and when she was confined as she had been after her accident. I’ve taken many pictures of myself. I've photo shopped many more, always in search of an expressive image. My impulses are varied and contradictory. Certainly, I'd like to present myself in a certain way--as handsome, dashing, mysterious--but I'm also keenly aware that I often appear ridiculous, goofy, and, yes, completely narcissistic. Lately, I’ve noticed I’m getting uglier. I snap pictures of myself and I’m surprised: I look weathered; my prominent nose looks uneven, somehow more flattened and large; and there’s this line, this new line that runs down my left cheek. What’s that line doing there? Perhaps too much wine, not enough sleep. My feelings might best be expressed in a line by uncle Dean: "How goofy and horrible is life." This is often how I feel: goofy, a bit horrible. My bouts with illness destroyed my sense of my good looks. 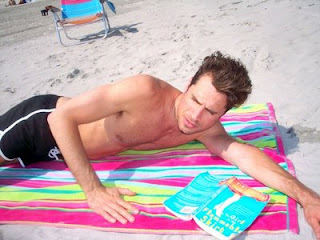 In a short period of time I lost twenty, thirty pounds; my skin yellowed, my eyes sunk. Tellingly, I have no pictures from this time. Had Myspace or Facebook existed, I would have stayed away. I still feel a bit wounded. And yet, I feel confident, which is something I try to express in my pictures. To me this sense of confidence is not about strutting, but acceptance--of who I am, what I've become. However, I don’t want this sense to drive my expressiveness into dour seriousness. Self portraiture gives me range to be slightly goofy. And to me, that’s the ticket—goofiness: the antidote to horribleness. I love the sense I get, while snapping my own photo, that I am participating in a goofy celebration. Surely, as Botticelli painted himself as the hero in the Adoration of the Magi, even as he actively engaged in "self-marketing," he was also laughing inside. After all, how goofy to paint oneself a hero? On the other hand, even as Frida Kahlo suffered immensely and charted this suffering in her paintings, she kept a still place in her heart for vibrancy. 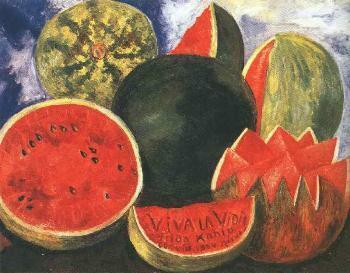 Kahlo’s last painting, in fact, (not a self-portrait) is emblematic of this idea. Painted merely months before her death, after the amputation of her leg, in the midst of a tremendous period of struggle, it is a testament to living. It is a still life of watermelons, chopped into halves, quartered, or left whole. The watermelons rest upon a plain brown table and are flanked on all sides by a clouded blue sky. Eight days before her death, Kahlo put the finishing touches upon the painting. She inscribed her name and date upon the red pulp of the foremost watermelon. Then, in capital letters, she printed a final statement on the red pulp: VIVA LA VIDA: LIVE THE LIFE. And this is really what I want to express in my pictures: the sense I have that despite my woundedness, or perhaps because of my woundedness, that I'm alive. I suppose this is a serious sentiment, but it is also a celebration. I would be lying if I didn't admit that I do the same thing, Seth, and for very much the same reasons (illness, fear of growing old, etc...). - From one narcissist to another. You can use 'photoshopped'. It's now in the dictionary. I laughed out loud when I read your second comment: "eff'n complicated." I think there must some sort of interface issue between US and AU. Of course I have no idea what "interface issue" means. The idea of self-portraiture as attempt at self-marketing, self-birth, and even attempt at immortality makes sense in your case, at least as one element in the swirling soup of "Why Seth Takes Photos of Himself." I've been a happy consumer of your images for a couple of years now. The frequency and sort of your self-photography (including that which you instruct others to do) suggests (1) you know you're beautiful ("still" and/or "again") and (2) you're prepared to have a little fun at your own expense from time to time. As I see it, narcissism meets and intersects with exhibitionism (in its normal, human "desire to be seen" sense) to varying degrees in people. I'm not sure of the mix in you, although there's bound to be some of the latter. Even relatively plain folks like me experience a bit of both even though we have to pick our photos carefully. There is almost certainly some hope that the display of the images somehow has an impact on someone, somewhere. The nature of that hoped-for impact is the root of what those photos mean to those of us who post them. You are not just a cross between Rembrandt and Botticelli. You are equal parts red wine and roasted chicken. Bert: I owe everything to red wine and roasted chicken. And if not everything, than a lot. I love self portraits. I've always been a fan of the camera timer. Often, while waiting for the camera's flash, I begin laughing in anticipation! I can relate to the goofy feeling. I am goofy. Maybe I'm a narcissist. I have tons of profile pics of myself. I like all of your pictures. I don't like when people don't post a profile pic. It makes me think they have something to hide. As always, a pleasure to read your blog. Thanks for sharing. Jennifer.